Most people tend to head to Argentina for the plentiful dove supply, but the country boasts truly incredible duck hunting as well. This was something I was really excited for due to a variety of reasons. First, I had heard of some cool traditions that they do using horses and a boat to deliver hunters to their blinds, so I was excited to experience that. The other reason was because of the plentiful supply and the wide variety of ducks that I’d be hunting and had never seen before. So. day two of our trip was going to be dedicated solely to ducks. I couldn’t’ wait! It’s winter in Argentina right now, but this doesn’t mean it’s as cold as our Minnesota winters. However, temps down there do dip at night. We were up super-early in the morning which is pretty common to all you duck hunters out there. Too, anytime you hunt around water it is pretty cold…this hunt was no exception. I literally had on every layer of hunting clothing I brought on the trip as we left the trucks. Once all bundled up and our waders on, we walked across a big marsh in the dark. I had no idea what the area looked like, but as day started to break the ducks were everywhere! We didn’t have any decoys out to start and were simply pass-shooting them as they flew over us. This was a total blast. After the sun came up, we switched directions and suddenly we had an incredible looking decoy spread! The guide had taken all the fallen ducks and propped their heads up with sticks creating a great looking spread. I recall my dad telling me that the Cree Indians would do this, so it was really cool to see in action. Most of the ducks were a type of teal, but they were all really interesting looking. We didn’t have a floating or above the water platform blind, but simply stood in the brush and enjoyed an absolutely breathtaking morning. The sun warmed us up and the ducks continued to fly until mid morning. By 10AM the action had slowed up so we headed back to enjoy a huge lunch. 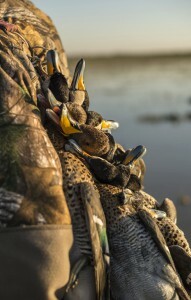 We still had a few more ducks we could shoot that day, so we headed to a slightly different area for an evening shoot. Instead of having such a long walk through the mud and water, they asked if we would partake in their tradition of being pulled out by horse. It sounded pretty cool so both Justin (my guest and friend) and I agreed and got one of the most enjoyable rides out to the duck blind that I’ve ever been involved in. Our evening setup was pretty similar to that of the morning where we had no decoys until we shot a few birds via pass-shooting. In the end, we had phenomenal shooting, a great experience and I was able to brush up on my Spanish with my guide. The best part of it all came when the chef served our duck the following evening and it was by far the best tasting duck I’ve ever had. Served rare and cooked over an open fire with secret spices…it really was the icing on the cake.